In the previous post, we have explained how to create UI elements like UILabel, UIButton etc using code. In this post, we will look into how to create Auto Layout constraint using code. This post assume you already know some basic Auto Layout knowledge. Starting from iOS9, Apple has provided us NSLayoutAnchor which make creating constraint in code simpler. NSLayoutAnchor are properties available on all UI elements (UIView, UILabel, UIButton etc) that can be used to set constraint on them. 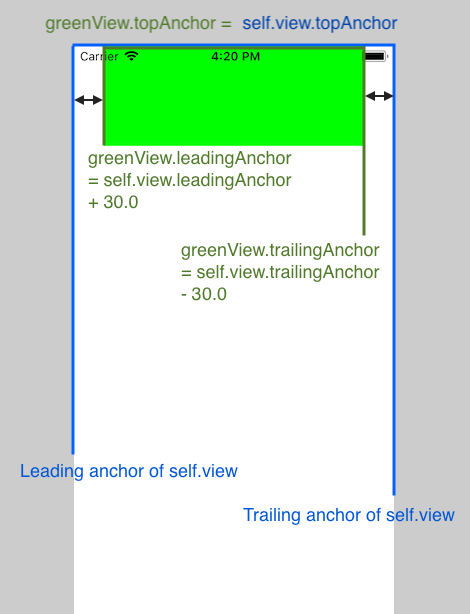 We create a leading constraint for the greenView by using greenView.leadingAnchor.constraint(equalTo: self.view.leadingAnchor, constant: 30.0).isActive = true. This will create a leading constraint with 30.0 constant from the greenView to the root view (ie. self.view). Remember to put isActive = true at the end of the constraint declaration code to activate it, else the constraint won't work. Same goes to other constraints defined above. There you have it! 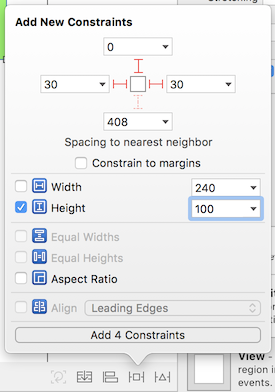 It's really simple to create Auto Layout constraint using the anchor syntax provided by Apple. 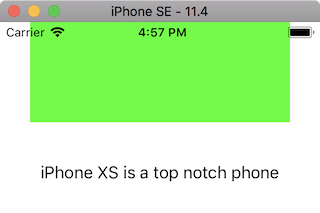 label.text = "iPhone XS is a top notch phone"
This is because we have set the topAnchor of the greenView to self.view.topAnchor, which mean the absolute top of the root view. 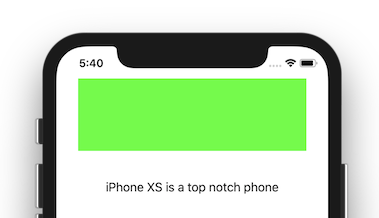 Apple has introduced Safe Area Layout Guide in iOS 11 which excludes area that might be cropped by the top notch and the rounded corner of the phone. We can change the anchor to set constraint against the safe area instead of absolute top of root view to prevent it being cropped. When you create constraint in the Storyboard / Interface Builder, it will automatically select Safe Area as comparison. Creating UI + Auto Layout constraint in code is greatly simplified thanks to NSLayoutAnchor and UIKit Initializer (eg: let label = UILabel()) provided by Apple. These are the basics you need to know to create UI in code. If you are interested to know more about NSLayoutAnchor, I recommend this explanation of NSLayoutAnchor by Keith Harrison. If you are interested to know more about why translatesAutoresizingMaskIntoConstraints need to be set to false, Keegan Rush explanation on Autoresizing Mask is great!